The topic of Search Engine Optimisation is often subject to over-complication. This may be the result of people trying to show off their expertise, or the requirement of business models based on selling SEO services or courses. Whatever the case is, this gets in the way of general understanding and prevents many website owners from making the right choices. The truth is that it doesn’t have to be complicated: SEO is just a way to ensure that a website reaches its audience. Of course this includes several methodologies, theories, and subdisciplines that a lot of very smart people have built careers upon. And let’s not forget the moving goal posts that are the periodic updates to the Google search algorithms, deployed an effort to improve search result accuracy as well as derived revenues. 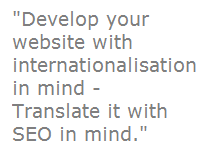 But do we need to understand all of this thoroughly before we can set up an SEO Localisation strategy? No. And do we need SEO gurus to make localised websites visible? Absolutely not! First let’s get some clarity and context around the acronyms. SEO: Search Engine Optimisation. Activities aiming to improve the way your website ranks among the organic results (meaning paid for, or “sponsored”) in a search engine. SEM: Search Engine Marketing. Sometimes used as a synonym to SEO, it usually includes SEO plus other approaches such as pay-per-click campaigns, with consist in getting websites listed in the sponsored links area of the Search Engine Results Page in exchange for a fee paid to the Search Engine provider every time that link is clicked. Dark SEO or Black Hat SEO: a semi-humoristic way to describe methods to achieve SEO by trying to outsmart the system. This may include link farming, comment spamming, keywords stuffing and other activities ranging from tedious to sinister. MSEO: Multilingual SEO, but also Mobile SEO. SEO for translated websites in the first case and for Search results on Mobile devices specifically in the second. ISEO: International SEO, like Multilingual SEO. LSEO: Not Localization SEO, or Localized SEO. This is Local SEO and it has less to do with translation, more with location. LSEO tries to ensure that if you search for the word “butcher”, you find the craft butcher closest to your home, rather than the butcher whose website gets the most traffic, or which mentions the keyword “butcher” the most. This is as much a matter for Search algorithm programmers as it is for website owners. SMO: Social Media Optimization aims to promote visibility on Social Media Networks such as Linkedin, Twitter or Facebook. VSEO: Video SEO is interested in the visibility of your video content, for example when users put related searches in YouTube, Vimeo etc. I already mentioned Black Hat SEO above. In my opinion it is best to stay well away from this. Results are uncertain and the risks simply too high. For every would-be SEO Dark Knight, Google has an army of engineers and bots ready to slam the gavel. They actively seek and demote methodologies and sometimes individual websites which attempt to artificially improve their page ranking. Once demoted, there is no appeal process! In this realm, SEO is very similar to doping in cycling: in the short-term there is potentially a lot to gain, at least in terms of ranking. But your business may never recover once a search engine operator such as Google black lists it. One aspect of SEO that is totally legitimate yet often ignored or at least not given enough attention, is Localisation. Much like in the area of software developement, localisation often remains an after-thought in the website developement cycle. In-country staff: your LSP has professional linguists based in each of your “target” country. If you have an established relationship with your LSP, these linguists are familiar both with your content and your target audience. In fact, they quite possibly are a part of your target audience and therefor best placed to improve your local message. SEO qualification: among this same staff, your LSP most likely has linguists who specialise in SEO Localisation as part of a range of targeted skills. Localising keywords: there is more to this than just translation. In some ways it is more a keen to Transcreation, which is another skills on offer by LSPs and not SEO agencies. You want localised keywords which are the terms most likely to be put in a search related to your website by someone in the corresponding location. This doesn’t mean re-doing the SEO research but it certainly isn’t a simple translation of your source keywords either. Testing keywords: your LSP should be able to estimate the performance of translated keywords, perhaps give you several options and check the Search engines most commonly use in-country. Famously, the Google search results are less relevant for a Chinese audience because it isn’t used as much as Baidu in China. You will also have to monitor keywords performance, and perhaps refresh their localisation periodically. For example new technologies tend to appear in countries where the business language is English. Early adopters are also more commonly familiar with English. Consequently when a technology is very new, people around the world are more likely to search using its English name. As it becomes more prevalent, the translated name will become more common and will be used in more and more searches. Using localised keywords: keywords are great but if you paste them into a metadata field and forget about them, they are not going to serve you well. These keywords have to be used in the translated content on your website. Professional translators have Terminology management technology which is perfect for this. Every time a keyword in detected in the source text, the CAT tool can suggest one or more SEO tested translations and help the translator use the keywords consistently. Other SEO activities: yes there is more to SEO than just keywords. LSPs big or small, have had time to develop sophisticated SEM offerings. Check with your existing translation partner or find one which offers a complete Localised SEM range of services you need. Value: last but not least, LSPs are likely to offer these services for better prices than specialised SEO agencies, who while they have the SEO expertise, do not have the technology or localisation know-how to provide Localised SEO effectively. This entry was posted on August 5, 2013 at 10:57 am	and is filed under Beginner's Guide, Internationalization, SEO Localization. Tagged: Globalization, International SEO, Multilingual SEO, Search engine marketing, Search Engine Optimization, Search Engine Results Page, SEO Localisation, SEO Localisation strategy, SEO translation. You can follow any responses to this entry through the RSS 2.0 feed. You can leave a response, or trackback from your own site. Great article! I couldn’t agree more. Many people seem to think of SEO as this mysterious entity whose secrets are known but to a chosen few. I’ve participated in so many discussions about SEO where people think that they only way to get results is to throw money at an Internet Marketing agency. In actual fact, as you rightly state, SEO is simply about creating great content that can easily be found by both search engines and human visitors. In this respect, there are so many fairly easy adjustments that individuals can make to their own websites that will have a significant impact on search engine rankings such as optimizing content, titles, descriptions and keywords. After that, of course you might need some help in identifying the best keywords for your target markets and optimizing your localized content, and a good LSP will surely be able to help you out there. In this way you can get good results without spending a fortune – and no hocus pocus required!